Innovation. It's a huge word, laden with diverse meanings, hopes, fears, and some confusion for people living in the 21st century. 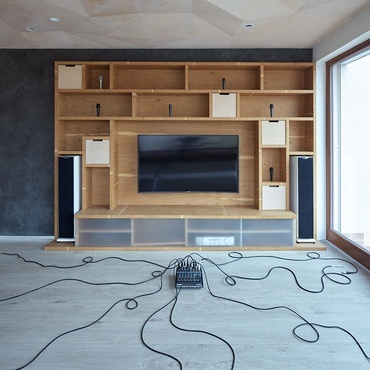 For the design industry, the question of innovation permeates both the way business is done and the future development of the built environment and products. 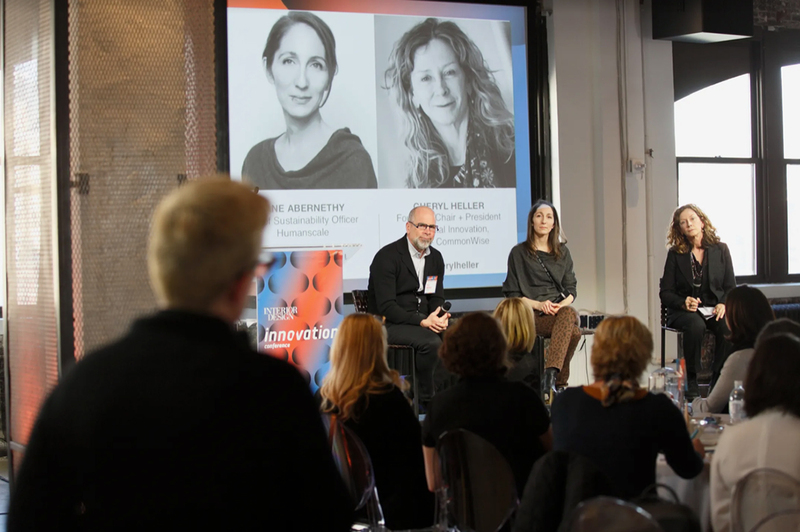 At the inaugural Innovation Conference, presented by Interior Design in partnership with Interface flooring, 10 luminaries from a variety of industries took the stage at NeueHouse in New York City to expound on what innovation looks like today. Over 100 attendees, including designers, manufacturers, and other creatives, were up and ready to pay rapt attention when Interior Design Editor in Chief Cindy Allen kicked things off at 9 a.m. The morning began with a series of video interviews with non-designers, posing to them this question: “What is innovation?" The diversity of answers illustrated one crucial point: While there is no solid consensus on what innovation means, most people feel a mix of apprehension and wonder around it. 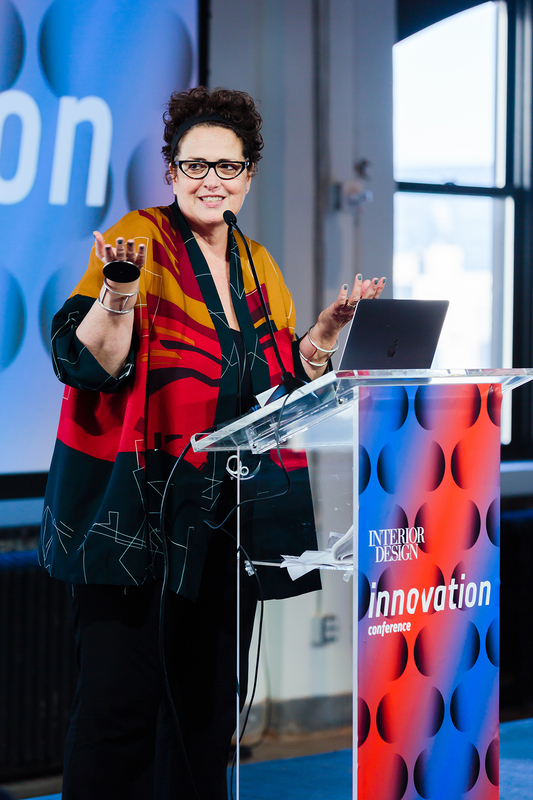 Interior Design Editor in Chief Cindy Allen hosted the day-long Innovation Conference in New York City. Photography by Erik Bardin. "Clearly, we need to talk about innovation more," said Cindy. "Good thing you're all at Innovation Conference because that's exactly what we're about to get into." The first presenter, Gatorade's Head of Design + Innovation Xavi Cortadellas, walked the audience through the company's latest innovation, a personalized sports beverage called Gx, and how developing this product went hand-in-hand with creating a new digital platform business. As he explained in his presentation, “Ecosystem Innovation: Evolving Towards a Platform Business,” the method he and his team used to get Gx out to market was surprisingly scientific—it began with a hypothesis, advanced to in-field experiments, and moved to actualization and data-gathering. What did not happen, Cortadellas said, was a conclusion. "Innovation is never linear," he said. "Designers know this better than anyone." 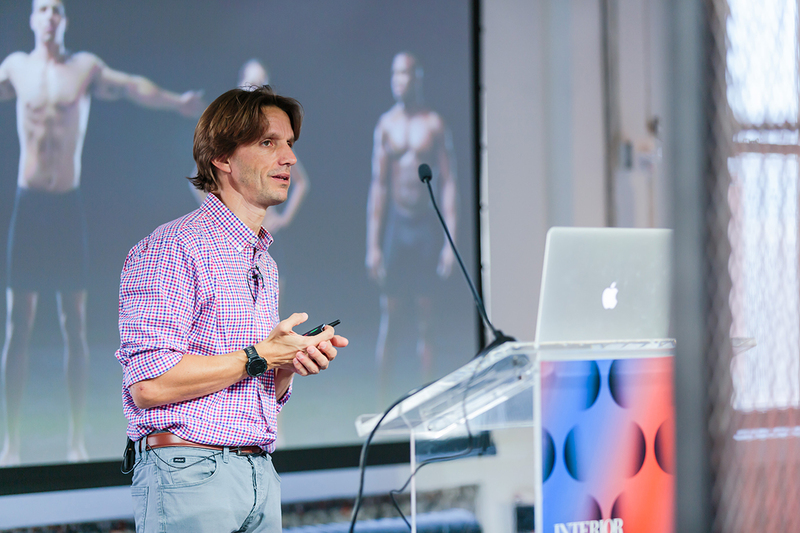 Xavi Cortadellas, head of design and innovation at Gatorade, addresses Innovation Conference attendees. Photography by Erik Bardin. 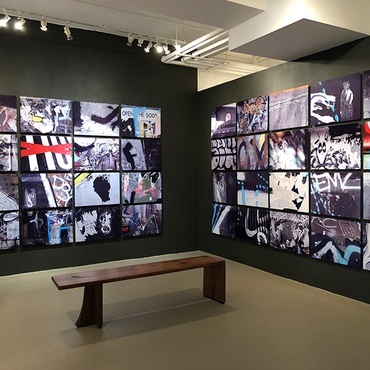 Becky Wang, CEO and co-founder of innovation and content studio Crossbeat NYC, shared her insights on how to best connect with the two youngest and most controversial generations in today’s workforce: Millennials and Generation Z. 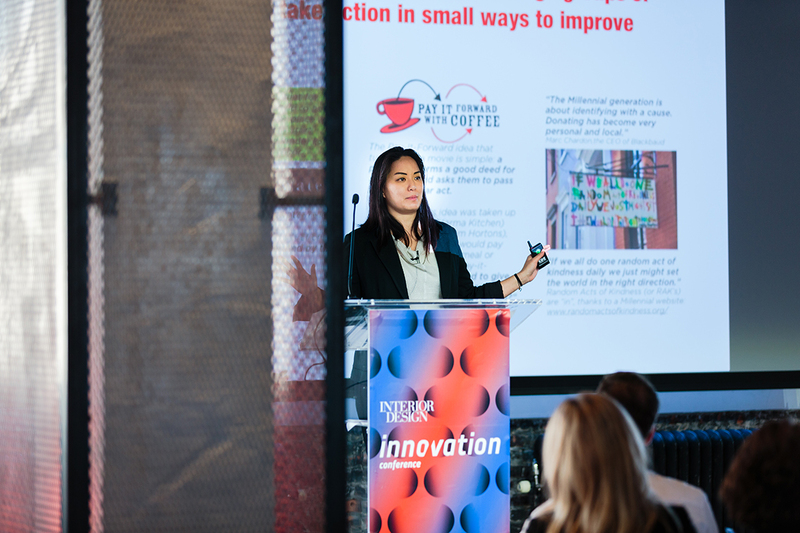 In her talk “How to Inspire the Next Generation of Innovators,” Wang illustrated how she was able to understand the principles that young people embrace today through machine learning and data-gathering, and how to translate this data into actionable marketing strategies for brands. According to Wang’s research, one principle that Millennials and Gen Z are steadfast proponents of is sustainability. These generations aren’t hellbent on destroying once-treasured institutions like the canned tuna or paper napkin industries because they hate old(er) people—instead, Wang discovered, Millennials and members of Gen Z embrace compassion for all living things as a value, which makes the felling of trees for single-use napkins or the suffering of dolphins caught in fishing nets untenable. “There’s a deeply personal, heartfelt path that leads these generations to embrace sustainability as a non-negotiable value,” explained Wang. With that, Cindy called for a lunch break, allowing the attendees to absorb all they had learned that morning and get ready for the next round of stimulating talks. The program resumed with coffee, desserts, and the welcoming of the keynote speaker, Nike’s Global Vice President of Retail Innovation Byron Merritt. 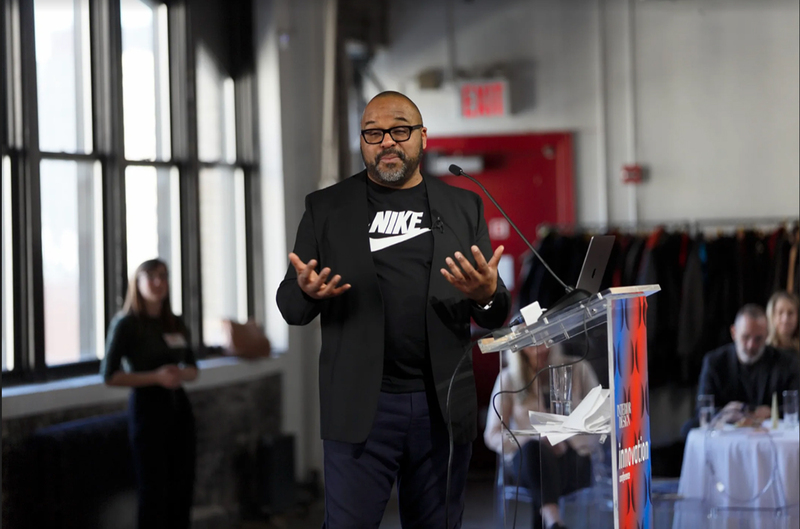 As the VP of retail innovation, Merritt explained how he uses his formal education in architecture to reinvent the way Nike’s consumers interact with the brand in both the physical and digital realms. “Our mission is to bring inspiration and innovation to every athlete in the world, which for us means everyone,” said Merritt. The way he and his team accomplish this is by leveraging digital technology to enhance physical spaces. What does this look like? 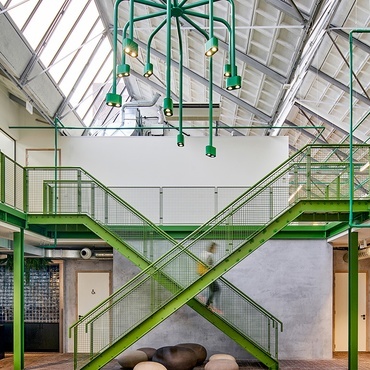 Perhaps the best representations are in Nike’s Houses of Innovation. Merritt gave walkthrough presentations of each space, emphasizing how each discrete part of the store can interact with the mobile Nike app to better facilitate consumer actions such as locating products, finding alternative sizes or colors, reserving fitting rooms, purchasing items, setting up appointments at the Nike concierge desk, and even creating personalized Nike products. “Using design thinking, we will continue to push the edge in service design, removing friction from the customer service experience through advanced digital tech,” he said. Next, a panel on sustainability got down to brass tacks about climate change and the current lack of real action from the design industry to address it. “We all need to move now, we need to do better,” said Chip DeGrace, vice president of workplace applications at Interface. He was joined by Cheryl Heller, founder of Design for Social Innovation, and Jane Abernethy, chief sustainability officer for Humanscale. Interior Design's Pamela McNally (foreground) moderates the Interface Panel on Sustainability (from left): Interface's Chip DeGrace, Humanscale's Jane Abernerthy, and Design for Social Innovation's Cheryl Heller. Photography by Erik Bardin. 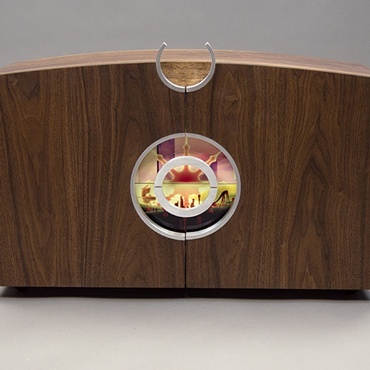 Heller in particular was a strong voice, insisting that designers need to evolve beyond traditional design thinking and embrace social design in order to have any real climate impact. But what is social design? According to Heller, social design stresses collaboration above all else and this way of thinking fundamentally changes the designer, opening minds to thinking on a larger scale than whatever design problem exists in the foreground. Obviously this can have major consequences when thinking about ecological impact. “We all have a responsibility to recognize our agency in this problem. We have to look around and realize that the world is on fire. Business as usual is over,” warned Heller. 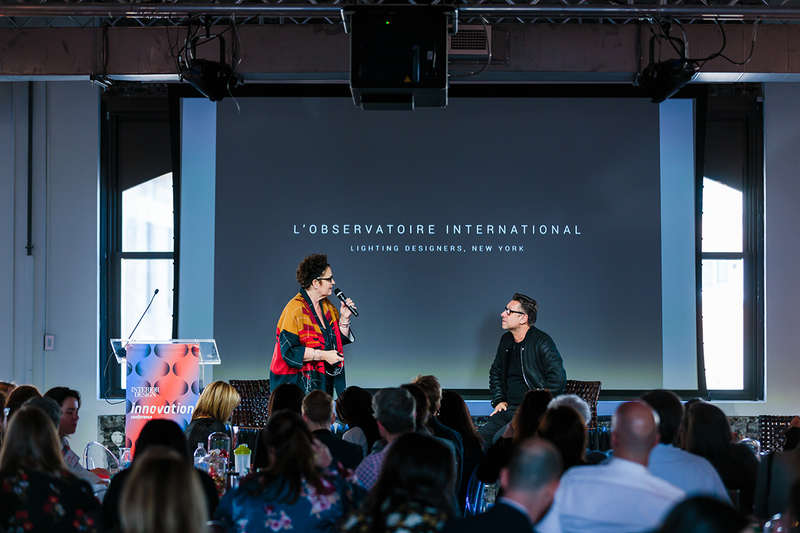 Following this rather dire conversation came a more light-hearted chat between Cindy and the illustrious lighting designer Hervé Descottes, founder of L’Observatoire. 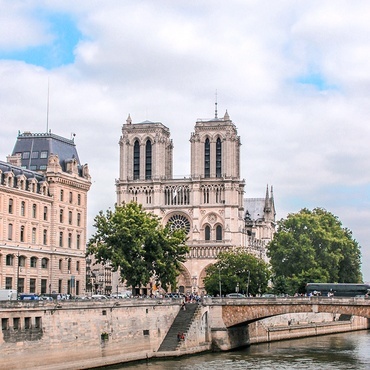 Together, the two friends explored Descottes’ portfolio of impressive projects, including the Louvre, the Palace of Versailles, Juilliard’s Alice Tully Hall, and the High Line. 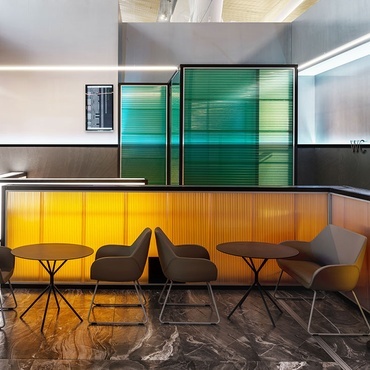 When asked how, as a lighting designer, he contends with different opinions or experiences resistance from architects he works with, Descottes had this to offer: “Lighting is all about a vision. You have to be able to communicate that vision with people you work with. [It’s] the first thing to do.” Cindy followed up on this thought, noting that no one in the design industry can accomplish great work alone. “It really is all about collaboration, which we’ve heard so much about today,” she said. 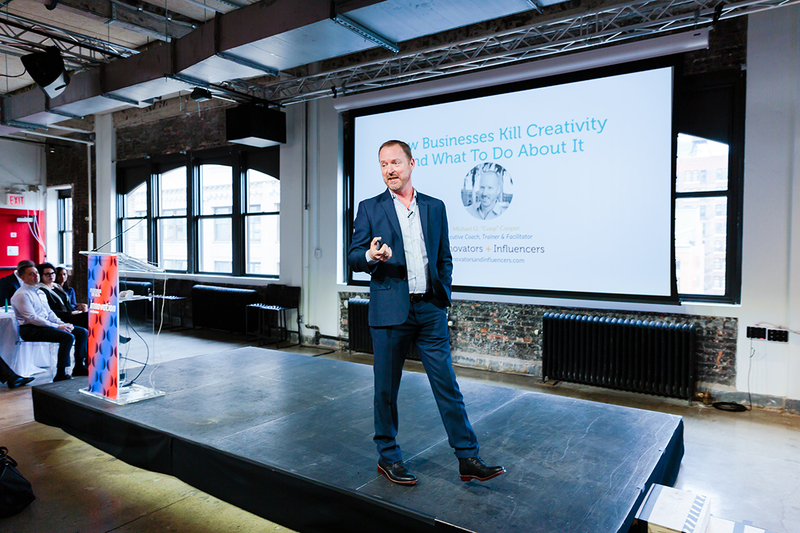 After a coffee break, attendees welcomed Seth Johnson, program director of design practices and community at IBM, to the stage to address "Design Thinking for the Modern Tech Enterprise." 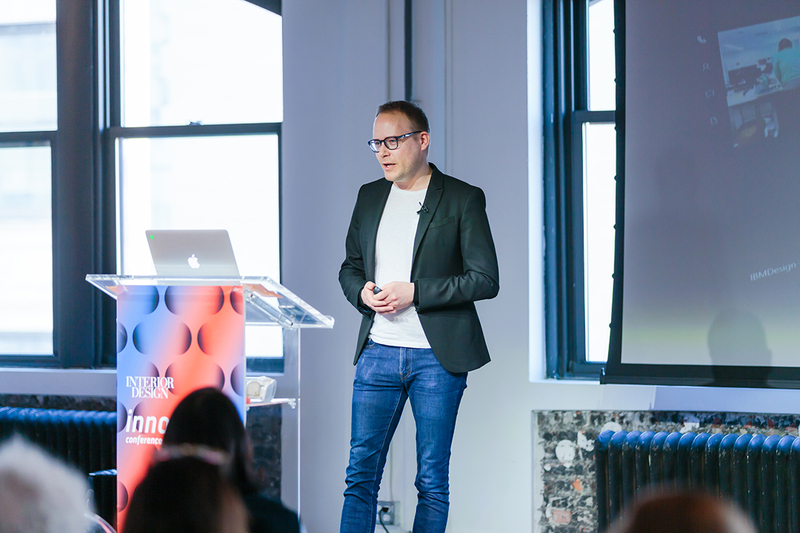 “Design thinking in the context of big tech companies is different—has to be different—than formal design thinking,” he explained. The reason? The transition the economy has made towards prioritizing services rather than products. 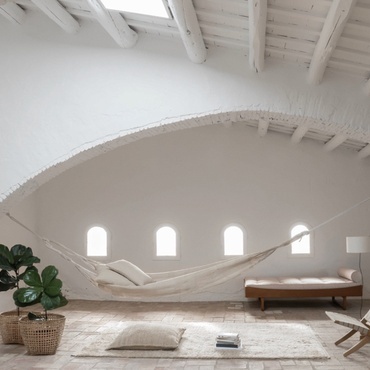 Today, designers have to contend with the inherent uncertainty that comes with expansion of consumer-oriented services and rapid advancement of technology in the modern world. 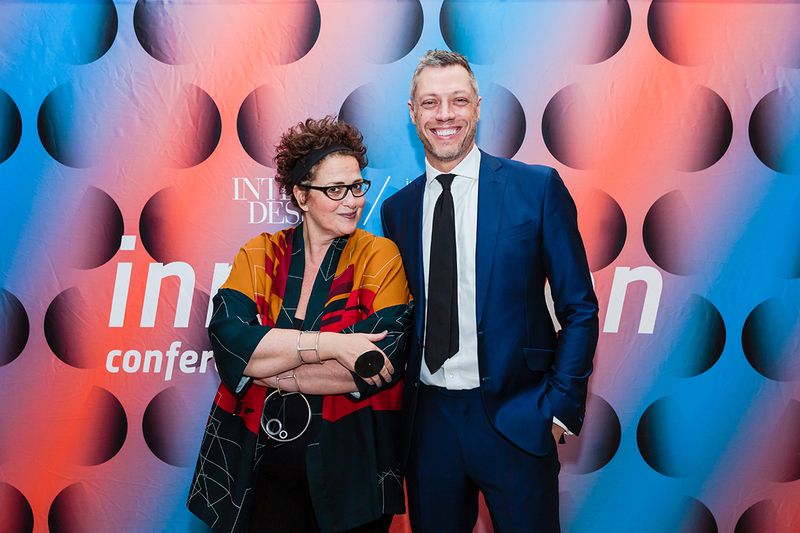 Interior Design's Editor in Chief Cindy Allen and Material ConneXion's Dr. Andrew Dent. Photography by Erik Bardin. 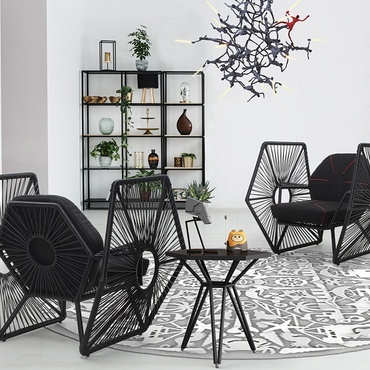 Interior Design is excited by the fascinating ways innovation is shaping our world and we’ll continue the conversation in our forthcoming Big Ideas issue, due in March. Until then, continue to check in on Innovation Channel for more exciting developments in today’s innovative world.